– Chizhevsky A.L. «The Earth echo of solar storms», M., «Mysl», 1976 (to download the book for free) reveals the connection between many natural phenomena and solar activity peaks (hereafter referred to as SA). Based on the statistics it thoroughly examines the interrelation between epidemics of deadly diseases (plague, cholera, flu and others) and SA peaks. The investigation of causes and development of Dyatlov’s Tragedy set us (Pavel Yakovlev and I) thinking of connection between accidents in tourism and mountaineering and SA peaks. This serious catastrophe with tourists has happened when SA peak of 1957-1959 was abnormally high (the 19th SA peak). It was the most powerful SA peak for all the period of its observations (Wolf number: 190). It took place at the abnormal peak of accidents in tourism and, besides, the same years there was a jump in accidents among climbers as well. There was a heavy increase of victims, as well as number of serious tragedies that led to loss of the entire teams. Due to this situation the authorities made the unsuccessful attempt to «close» amateur (sport) organized tourism forever, but this administrative measure led only to the fact that the number of accidents in tourism rose approximately twofold. The tragic consequences urged to make considerable changes and improvements in organizational measures, and the accidents wave was reduced. Nowadays we know that the number of accidents became less then thanks to the recession of solar activity till the next SA peak. According to the statistics of accidents in mountaineering provided in the book «We remember you» (Starikov G.A., Shataev V.N., M., Balabanov publishing house, 2010), to the certain statistics of accidents in tourism (1975-1996), as well as according to the information about SA observations (by Wolf number this is a sum of number of sunspots and tenfold number of «groups of sunspots», and by the level of solar radiation at the wave 10,7 cm or 2800 MHz) we have made charts of dependence between SA and accidents for the period of 60 years for mountaineering and 21 years from 1975 till 1996 for tourism. In order to adjust the scale the charts were made in relative values. In the beginning we considered the accident rate as a reliable known absolute maximum for 1990 for mountaineering – 65 victims and for tourism 77 victims) and SA as a maximum value (by Wolf number equal to 190 for 1958). But later it turned out that it is more reasonable to refer the accident rate and SA to the corresponding maximums of these values within each solar cycle. We also decided to calculate an «average» value of the accident rate within each solar cycle for comparison of peak height with an average accident rate within each solar cycle. Owing to these procedures we could almost eliminate the influence of unsteadiness of the process. This happened mainly as a result of higher popularity of tours and ascents (the popularity, of course, led to more accidents, but in the investigation of SA influence this effect should be excluded as a factor that was not connected directly with SA). In tourism an absolute maximum evidently arrived at 200 victims in 1959, but this number is uncertain so we cannot consider it reliable. Below you can see the curves of relative SA and accident rate in mountaineering (pic.1). 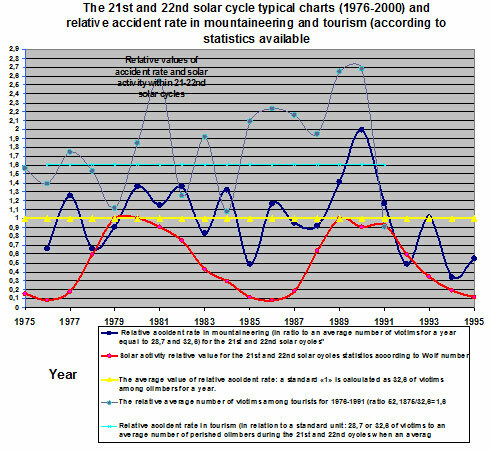 There is also a yellow stepped graph of an average accident rate within each solar cycle. This is a relative level where «maximum height is calculated». We found that the statistics of accidents, collected during several years, had some «lapses» it was not complete and could not be considered as reliable for obvious reasons. This period includes the Great Patriotic War and a postwar decade at the 17th-18th SA cycles. To adjust the statistical characteristics we had to eliminate them in the course of subsequent investigation. The SA is calculated relatively the maximum value of the 19th solar cycle that is equal to 1. The blue graph that stands for a relative accident rate shows the coincidence of its maximum value with maximum SA, gradual increase of accidents till 90s that was caused by higher popularity of mountaineering. According to the graphs, during several «low» SA cycles (e.g. at the 20th in 1966-1967) peak of accidents follows SA peak with some delay, i.e. in this case solar energy doesn’t affect at once but after accumulation for several years. In the early 90s the chart shows a general «stoppage» of number of accidents and its abrupt and unsteady surges caused by decrease of tourism and mountaineering popularity during economical and social crisis in Russia and CIS. Nevertheless, the peak of accidents was observed at SA peak in 2000. At the beginning of 2000s the process fluctuated and regulated, but at the level even lower than in the late 1980s. Obviously the number of accidents depended on many factors: improvement of equipment, machinery, tactics, geography and management of ascents, campings and rescue operations. The influence of many factors provoked the instability of the process with evident fluctuations. When making the same dependence charts for 2 years («current and previous») the characteristics are more smoothed, and exceeding comes to 40-70. Besides, the accident rate is also high during the years close to a «peak» period. And there were not any «lapses» observed near powerful peaks, except the period of global instability following the stoppage of the process. On the basis of available statistics we also have made other charts: even smoother dependence chart for 3 current years (including a previous, current and next years), as well as the charts of accident rate and SA dependence in ratio to the maximum values within each solar cycle (normalized within a solar cycle). We also have built similar charts of interrelation between accident rate and SA relying on the statistics of the accidents in tourism collected in 1975-1991. In tourism the interrelations is very close to ones in mountaineering, although there are some differences (in particular, depended on the number of tours and ascents). Unfortunately, it was impossible to collect all statistics information for many years, so we still don’t have a complete picture. By radiation level at the frequency 2800 MHz (a wave’s length is 10,7 cm) the charts of accident rate dependence and SA charts are very similar to the interrelations by Wolf number. That is why we didn’t get new information but they confirmed the results we have arrived at. The charts listed above can be found in the Appendix 3. For the statistics of accidents in mountaineering we have used more profound functional dependence characteristics (correlation, autocorrelation and spectral). The maximum value of correlation between SA processes and accidents’ number in mountaineering amounts to about 0,8 (or 80). That means that there is an interrelation of processes (absolute maximum of autocorrelation function, i.e. this function self-interrelation at zero time shift, is equal to 1,0 or 100). The interrelation can be also corroborated by frequency of accidents with periods around 10 years these periods almost coincide with frequency of SA peaks (SA cycles period in the 20th century averages 10,5 year). The interrelation charts listed can be found in the Appendix 4 at the end of this article. The most powerful and typical peak of accidents in mountaineering took place during the peak of the 22nd SA cycle when camping trips and ascents in the USSR (CIS) were the most popular. For the 21st and 22nd SA cycles we have built charts of relative accident rate both in tourism and mountaineering. The average accident rates for one cycle are equal to 1,0 for mountaineering (a yellow straight line «1,0»), and for tourism 1,6 (a brown straight line «1,6» with diamond-shaped yearly markers). The general mechanisms of the accidence process, also typical for other SA cycles, can be traced in these charts. The accidence peak is followed by recession of almost 1-2 years. After that there is some kind of increase – a low «local peak» having approximately average level of accidence compared with maximum value (an «average level» is understood as arithmetic average for the current solar cycle according to victims’ number). Then we observe one more recession of accidents lower than average level being at the SA lapse («depression»). The depression is changed by a local «depressive» peak at low level that can be compared with average values of accident rate (and exceeding them from time to time). After that a depressive peak is followed by decrease of relative accident rate, and finally, when a new SA peak is close, we can see a rise till a relative accident rate level. Regarding some lowest SA peaks the accident rate in mountaineering delays to arrive its peak and shows itself more «blunt» (and sometimes «forked») a bit later. For instance, this can be traced during the 20th cycle in 1964-1975. Evidently, the increased power of the Sun affects not at once, but «integrally», i.e. over a particular period of time as a result of accumulation of impact power. During «strong» peaks the impact shows very fast, next to the «peak». But during «weak» peaks it takes place later and the peak’s size depends on the influence of other random factors of the accidence. The 19th SA peak (during which we observed a lot of accidents in mountaineering and in tourism) was indeed abnormally powerful regarding not only its «height», but also its duration. It lasted almost for three years. It is clear that by 1959-1960 the integral (cumulative) effect from such power has been very strong, and it was obviously that additional factor that enlarged the number of accidents in mountaineering and especially in tourism (approximately up to 200 victims per year). From accidents history we know that during SA peaks we face the largest and the most serious disasters which occur in the places that were considered safe before. In 1990 (practically on the 22nd SA peak) a strong ice avalanche buried a camp of climbers in «Pan» under Lenin Peak. 43 persons have died – this is the most serious disaster in the records of accidents with climbers. The abnormally severe avalanche took place on Huascaran in Peru in 1970 right after the SA peak of 1969 burying the towns Ranrahirca and Yungay and killing more than 20 000 people. A similar rock-ice slide in the Karmadon Godge in Caucasus in 2002 seemed to happen after power accumulation of SA peak of 2000-2002. During current 24th SA cycle we have already faced quite unexpected and abnormally heavy for consequences accidents resulting in the death of mountaineers. On June 22, 2013 the terrorists shot to death 11 climbers in the international camp near Nanga Parbat. The policemen investigating the case were also killed but, nevertheless, most of the terrorists were arrested and sentenced. This year on June 18 on the Everest the ice slide killed 16 Sherpas. Severe catastrophes causing death of 12 climbers, six for every accident, took place on Mount Rainier (USA) and on Argentiere (3901, the Mont-Blanc massif). The total increased accident rate during the 24th SA cycle can be proved by disastrous floods, hurricanes and typhoons (e.g. the terrible typhoon caused a lot of damages in the Philippine Islands). We also can see its influence in the wars in Ukraine, Syria, Iraq and on the border between Israel and Gaza Strip. SA peak also caused Ebola epidemic in Africa with 2500 victims. it is a mistake to consider SA a main reason of increased number of accidents during SA peaks. But SA is a significant and potent additional factor causing accidents this is that «powerful impulse», making unstable all the natural processes which, because of their development, become changeable when SA increases sharply. These processes do not have enough «stability reserve» and can be unbalanced by quite strong external impulse – SA peaks are those impulses. SA is a strong additional accidence factor that, showing itself and putting together with other accidence factors, leads to significant increase in number of accidents within big random samplings with objective critical situations or disasters. SA influences the number of accidents in tourism and mountaineering by means of its numerous components. We can observe intensification and increase of climate and weather effects, cyclonic activities and general critical process disturbance in the atmosphere. The bad weather is characterized by sudden jumps of temperature, pressure and strong winds – hurricanes, typhoons and tornados. All other natural disasters also worsen: rockfalls, landslides, avalanches, icefalls, rivers flows and inundations, earthquakes, droughts and fires. SA affects noticeably a biological behaviour of people and animals, because all creatures live off solar power. This stimulates the situation when social conflicts and epidemics of different deceases become worse people start to behave inappropriately – especially under difficult conditions forced by natural disasters. It’s not only mistakes that increase, but these mistakes lead to «serious consequences». For example, in the situation when a simple inertness of the captain and a little mistake made by inexperienced «navigation officer» (i.e. a ship navigator – controlling a helm and an engine) can cause loss of the ship and people. Like a recent accident with a ferry in the waters of South Korea. Or Boeing from Malaysia shot down in the war zone in Ukraine, as a result of inadequate, unthinking and provocative behaviour of people who became of unsound mind during civil war. So, the Sun power impacts natural phenomena using a lot of «channels» the accidence interrelations are profound and could be seen only after the tragic accidents occurred. And in this context it is impossible to foresee the main reasons of future disasters. But it is possible to foresee general trends of accidents increase during SA peaks and in order to decrease the number of accidents it is necessary to take extraordinary security measures when SA peak arrives its dangerous period. The 24th SA peak in 2012-2014 made us examine closely the statistics of accidents in mountaineering and tourism. According to the film-requiem about victims of the mountains in 2013 there were 32 climbers who died in CIS. We have exact information about 22 tragedies (see - 18 climbers and 4 people died in Nanga Parbat: Igor Svergu, Dmitri Konyaev, Bodavi Koshaev and Ernestes Marksheites), and some of 32 accidents can be classified as «touristic» ones. The valid number of climbers who died during the 24th SA peak lies in the «range» 22-32 victims, and the half of these figures should be regarded as a «relative average» value - from 11 to 16 victims. The yearly accident rate at this level should be considered as «moderate» (and typical for an evident «decline» of solar activity). The higher figure more than 16 should be regarded as increased – at the SA depression. The value in the rage from 20 to 32 should be regarded as increased, but this time it refers to SA peak. That is my approximate prediction for a current year 2014. The rough «trend line» (a prediction line) can be also made for the next years (now we are working out its model). The exact figures for 2014 we can obtain at the end of this year. The available statistics of Wolf numbers say that the 24th SA peak is forked: the first peak took place in 2012 and the second – in the beginning of 2014 (it can be seen on the chart in the Appendix 2). In 2012 we saw the death of 20 climbers (or 21) – almost the same number of climbers died in 2013. By intensity and form the 24th peak reminds the 21st SA peak of 1976-1985 that was not very high, but during which the worst accidents happened both at its highest points and a bit later – after the accumulation of all power of the peak. And now we also can face the situation when the second peak of accidents arrives a bit later and falls within 2015-2016. Although the general high level at the 21st peak is low but due to stretching of peaks for 3 years the total accident rate for these years is getting bigger. Besides, it is observed to be quite increased during the years close to the «peak». This summer after the death of 3 climbers (from CIS) the slack period set in. But on July 11 we received information that 2 climbers died in Kamchatka and on July 22nd – two more climbers (on the summits Adyr-Su and Jangui in the Central Caucasus) and one tourist (a woman) near Uzunkol. The yearly indicator for CIS climbers amounts to «minus 12» (or up to «minus 17» including 5 missing climbers») for a period of more than 6 months (besides, some cases, e.g. accidents and searching for missing people, are still in the process, and the number of victims can increase. The accident rate in tourism is approximately the same as in mountaineering – up to «minus 14». As far as I know last year 12 tourists died this indicator has already exceeded this year (although the statistics for two years can be incomplete). All the accidents with climbers and tourists that I know about in 2014 are listed in the Appendix 1. The statistics of 2014, including missing people, seem to «amount» to the number of 20-22 victims, i.e. up to relative «increased rate at SA peak». I clearly understand that «solar activity» is rather a powerful factor in the way of activation of disasters in the Earth and increase in different kinds of accidents, spread of epidemics, aggravation of social processes and crimes. So as to see it better one has to collect all the facts about disasters on the studied natural phenomena. It is quite possible that this SA factor influences significantly economic indicators as well. Particularly, it can affect crops yield (mainly through weather, climate and natural disasters), business activity, commercial tourism (now during SA peak we observe a lot of bankruptcies of travel agencies) and so on. We certainly have to analyze the relation between transport accidents and solar activity charts. First of all, it is necessary to do with air and water transport, especially after a number of recent crashes causing numerous victims (including strange loss of big Malaysian airliner). Note. It is clear for me that current worsening of the tragic situation in Ukraine was triggered by the 24th SA cycle. This is an obvious factor, although there were other, serious, objective and subjective, reasons of social instability caused by criminalization of government, thievish redistribution of property, unwillingness and failure of new authorities to carry out a social policy (to protect vital economic interests of people, and first of all, to protect right to work and live decently by developing the economy). The social and economic crisis have evidently taken place in view of many factors, but if it developed in a «usual» manner the political conflict would probably start during the period of new presidential election in Ukraine. But «heat in heads» during SA cycle led to its outburst half a year before «estimated» date – now we can see the influence of this factor. All course of events shows that this situation was created by mentally ill people or people who were driven to desperation by their social conditions. It is also a result of mass manipulation through «corrupted» media. The people know little about the violation and terror methods and cannot understand that their favourite politicians and their rivals also have «hot heads». But those people, who do everything in a calmer and more thought-out manner, will win this battle, slowly but surely. The Crimea case proves it more than sufficiently. In Russia in 1917 we have already met quite similar situation – a «February revolution». The «February revolution» has happened in Ukraine and from history we approximately know what will follow it. The «October revolution» must mature, as a «baby» in the womb, in a few months. In the south-eastern regions of Ukraine this process has already arrived to the formation of military and political structures of DPR (Donetsk People Republic) and LPR (Lugansk People Republic) that oppose Kiev government. The course of crisis shows that such painful maturing is taking place as a result of moving forces of all economic and political processes in Ukraine. Obviously for mentally ill people any words would be enough. But some of the most active terrorists have already fallen victims of their own terror (unfortunately, it also resulted in numerous innocent victims in Kiev, Odessa and in the south-east of Ukraine). The conflict in Ukraine became a «little world war» that involves the mercenaries and volunteers from many countries. From «outside» the USA and EU are undoubtedly seeking for the ways to draw Russia in the civil war in Ukraine for the purpose of weakening of Russia and Ukraine. In the middle of 2013 we met with a scientific supervisor of Pulkovo observatory, professor Nagavitsin. He told us that, according to the opinion of the most competent foreign Sun investigators (probably, from Belgium), the 24th SA peak passed at the end of 2012 – at the beginning of 2013. But in our opinion, a Russian team of solar astronomers, SA peak is still under way. And the chart, given in the Appendix 2, shows that at the beginning of 2014 a solar activity arrived at its new maximum that started to decline only now – in the middle of 2014. I appeal to all tourists and climbers for taking maximum precautions during current season and next year because of general high accident rate caused by the 24th SA peak. So as not to fall in «additional statistics» of fatalities referred to just these acts of the Sun power. It influences people, equipment and all natural disasters it acts in a complex way using a lot of impact channels. I repeat that solar activity peaks are an additional factor of increase in accidents and at present its effect on unstable processes and spheres is very noticeable. All human «spheres»: a «natural» (general), «technical» (all technological items including domestic animals and cultivated plants), «mankind» (people and relations between them and «personal» (referring to a person itself), and also processes and states (including disasters) at the joint of all these spheres all of them are subjected to SA coalescence. The «critical opinions» claiming that the key reasons of natural disasters lie beyond SA influence (and its indicators) are insolvent. SA is being that independent factor of accidence that is acting along with other factors. 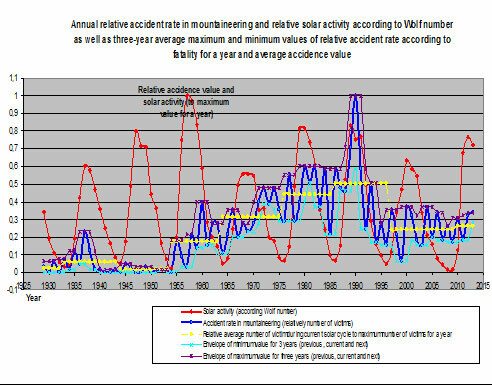 Besides, its influence can be equal if compared with the influence of other factors (in view of significant increase in accidents during SA peaks by 35-100 over «average values» and even more – over minimum values within each solar cycle by statistics of accidents in mountaineering). The current 24th SA cycle is remarkable for a number of disastrous floods and hurricanes that caused serious damage to the Philippines, Haiti, Far East, Central Europe and the Balkan peninsula. This cycle was preceded by a range of big earthquakes in 2011: some scientists associate it with influence of the Moon gravity that has been close to the Earth for some time due to the Jupiter gravity. Note. It seems suspicious when rotation period of Jupiter around the Sun (11,9 years) closely coincides with solar cycles period (10,5 years in 20th century): I see some interrelation between these two factors. After all the mass of Jupiter is very considerable (71 of the mass of other planets in the Solar System), and Jupiter is the most significant factor influencing the deviation of the centres of all planets mass in the Solar System, and the entire system rotates around it, including the Sun. Jupiter is the only planet of the Solar System masses centre of which, together with the Sun, goes beyond the Sun (by 7 against radius of the Sun). The astronomers investigated the interrelation between rotation period of Jupiter and SA cycles and came to a conclusion that due to the difference of processes nature (by their «linearity» and «non-linearity») they are not interconnected. But perhaps this interrelation was not thoroughly studied and that is why the investigation made is not profound enough?.. In this case the influence of gravity is not limited to occurring «tiding forces» in the Sun: as Jupiter goes closer or farther to the Sun all the objects in the Solar System start vibrating. Besides, we need to take into account that among scientists there are different opinions about problems that still are not understood completely, including, by the way, quite opposite. But reliable opinions should be recognized only in that case if they are based on true facts and arguments. Some inadequate critics (Yu. Savkin, V. Sidorov) write different absurd stories about me, as if I connect the reasons of Dyatlov group Tragedy with «Jupiter’s influence». These are interpretations that misrepresent and simplify my position that put assumptions instead of «assertions» and replace all complex of reasons of Tragedy by one reason. So I believe that people who write this are not able or do not want to interpret true facts and my statements based on these true facts. The analysis of world history shows that the most significant outbursts of social catastrophes, such as revolutions, rebellions, wars and economic crisis took place during SA peaks. SA peaks are associated with outbursts of epidemics caused by immunity decrease and mass reproduction of transmitting agents (insects and their carriers – rodents and other infected animals, etc.). For example, virus Ebola that has already caused death of thousands of people. From history we can learn that outbursts of wars and military conflicts also «gather» together near the key and depressive SA peak. We clearly understand that a number of objective and subjective historic reasons lead to wars, and SA peaks worsen these reasons unbalancing their combination till critical and disastrous situations occur. In some cases wars and conflicts are starting and developing during several years – in this situation it is much more difficult to track and prove their connection with SA cycles. Below in the Appendix 1 and 2 I provide the information about catastrophes with climbers and tourists in 2014, the facts about interrelation between biggest social disasters, crises and SA peaks in the 20th century (also links to some of the biggest calamities happened in other centuries during SA peaks). The Appendix 4 contains general information about changes of solar activity and the results of observations for it during 19-24 solar cycles. I insist that statistics of accidents in tourism and mountaineering should be thoroughly collected, investigated and improved. We have to make it global. The dependence of accident rate and solar activity (and, may be, other significant factors) will make predictions in order to evaluate a situation in general and give recommendations as for prevention of accidents, and, by the way, not only in mountaineering and tourism. I propose UIAA to pay attention to this factor and analyze available statistics of accidents in Europe and America (in high-mountain zones popular among climbers) for the purpose of revealing a connection between accidents and solar activity. I can see urgency and necessity of collection of this statistics and working out safety measures based on it. This is my «personal opinion» relying on valid data. In this case I am ready to collaborate and exchange of information with interested investigators. I am sure that the history of accidents in mountaineering and tourism in the USSR and CIS are not «exception» to the rule and apparent laws are appropriate to other countries and mountaineering zones that are subjected to the complete solar activity impact. But where the accidents have their local «peculiarity» as regards natural conditions and teams of climbers. I truly believe that it will not be possible to «eliminate» absolutely the influence of solar activity on the number of accidents, but in dangerous years we can make the influence of this factor less by way of special safety measures. Among the measures we can take in these years (until SA peaks go down) are: limitation of super difficult ascents, prohibition of ascents with rising difficulty, prohibition of super difficult first trials of the route, prohibition or limitation of soloing, increase in safety measures during ascents and other limitations taking into account peculiar features of specific zones and weather conditions. I also propose to close the access to the zones, summits and routes that are highly dangerous. Now we have time to monitor the laws of accidence by the time the next SA cycle will have come (and its peak will fall approximately within the period 2022-2024) and to try to make the accidence less by way of introducing advanced security measures. But we have to think which measures to take. In recent years the solar cycle usually has been rising within the period of 3-4 years (sometimes longer) and has been falling during 6,5-9 years. The current 24th SA cycle is not very «abrupt» and high because its Wolf number will hardly exceed 100 (approximately 2 times less than during the extreme 19th cycle). That is why the accidence peak probably will not exceed 40-50 over yearly average value (within this cycle). But the next 25th cycle is expected to be more powerful and could be similar to the 22nd SA peak. The number of accidents during the 25th cycle can amount 100 if the special safety measures are not taken. Earlier I have sent a letter to Russian Mountaineering Federation warning about high level of accidence and proposing to declare a «background» storm alert under the conditions of the 24th SA peak. But the Federation responded quite inertly and didn’t take any measures. It seems that they just didn’t examine, didn’t understand this issue and how it influences the number of accidents in mountaineering. By the number of CIS climbers who died this year I suppose that my «expected» fears, taking into account missing people, come true for the time being and accidence index is at its «increased» level. But the question is what level it is: «increased-exceeding an average value» or «high – maximum on SA peak». But we can draw an intermediate conclusion at the end of the year based on collected and specified information about all victims, and a final conclusion – after SA cycle finishes and all statistics is available. Judging by information about accidents abroad the statistics 2014 unfortunately is very bad and the accident rate seems being at its «peak». Based on the investigation conducted I understood that there is an interrelation between many natural phenomena (as «only natural» as human produced) and the Sun power. Moreover, the disasters intensify when solar activity is at its peak. During solar activity peaks a number of accidents in tourism and mountaineering increases by 35-100. Except those crisis years when, due to some accidents such as wars or deep social crisis, we observe a general breakdown in number of ascents and the accident rate is vibrating. It is clear that impact of SA peaks on the number of accidents in tourism and mountaineering is a SIGNIFICANT factor, which is acting along with other accidence factors. The factor that leads to increase of accidents by 35-100 cannot be «insignificant». Of course, we need understand that this factor works together with other accidence factors, and partially influences through them (e.g. worsening weather and climatic conditions). And every specific accident or catastrophe usually occurs as a result of a range of critical external impacts and/or dangerous situations or people behaviour. The increase in victims as a result of other disasters during SA peaks can be investigated collecting all possible information about specific disaster (e.g. car accidents, fires, floods, hurricanes, wars, social conflicts and etc.) and analyzing interrelations (correlations) between these phenomena and SA peaks and SA recessions. This regularity was found by Chizhevsky A.L. in the middle of the last century (and I am not a «pioneer»), but correlations effects and levels for every kind of disaster must be examined individually and include serious work on collection of statistic for specific catastrophe type. Currently I clarify with mathematicians which mathematical methods we will use for time series analysis. I will appreciate any assistance in specifying my information of accidence in tourism and mountaineering for any periods of time. 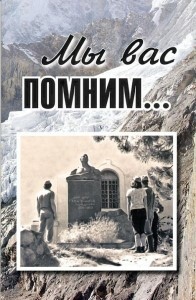 The book was also issued in English for our English-speaking readers and named "Mystery of Dyatlov group death". Nikolay Modin is a translator. This book will appear soon in its online version. We also demonstrated our film «Unfinished route» about loss, search and investigation of Dyatlov group Tragedy. The film was made in 2013-2014 by a creative team from Rostov-on-Don led by a director-cameraman Eduard Anischenko. Sergey Chonishvili was reading a narration and composers Artemiy Chayko and Natalya Smirnova wrote music (the latter also accompanied on the piano). The film is divided into 3 parts (each part lasts 30 minutes), altogether a bit more than 100 minutes. According to new fact found only when the film has been already shot I have made a «post» 8 minutes length where I shortly speak of these facts. In the film I played a role of writer and «real storyteller» (along with Chonishvili who speaks «off-screen»). This year at the end of May the film was shown at the 17th international film festival «Vertical» (in the category «Film about mountains»), and according to the results it was noted (together with other film) as «the best Russian film of «Vertical» festival. The film was demonstrated on the local TV channels in Rostov-on-Don and on ETV channel in Yekaterinburg after we had a performance there on July 31. In my next article «Yekaterinburg-Otorten: our meetings with towns, mountains, people and things» I will write about this events and about our camping trip to Dyatlov pass. This book gives a detailed answer to all key questions about Tragedy with Dyatlov group, while the film sets it out more shortly: without minor facts of the course of Tragedy, searching operation and investigation. Evgeniy Buyanov, engineer-physicist, Master of Sports USSR, S-Pb, 29.09.14.